I just finished one of the many responsibilities authors have that aren’t writing: copyedits. Specifically, copyedits on The Way We Fall. The copyeditor is an expert at proper grammar and punctuation, and marks corrections on the manuscript accordingly. S/He will also point out typos and inconsistencies in the story (especially in details and timeline) that both author and editor have missed, as well as sentences that s/he finds unclear, sometimes suggesting alternate wording. All of this is very, very useful. So how exactly is it work for the author? Well, it makes sense for all changes to the manuscript to be checked by its creator, just in case. Certain elements, like comma placement, can be very subjective and authors may decide their preferences in some cases are different from the copyeditor’s. Plus, especially when it comes to novels, what the copyeditor notes as being technically correct is not always how the author wants the story to read. 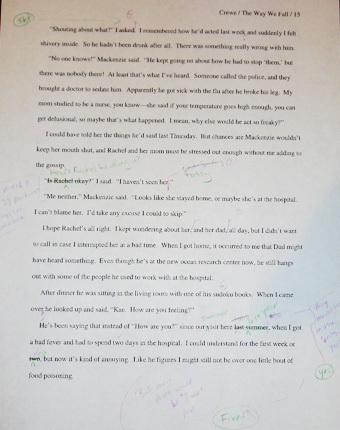 The copyeditor’s job is to point out what would be correct in formal prose; the author’s job is to veto any corrections to “mistakes” made purposely as part of the writing style or the character’s voice. This stage also gives authors one last chance to make other changes to the manuscript, if they notice parts they feel need a little more work, before the book is produced in a form that will be sent to reviewers. What comes next? In varying order, page proofs, a cover, and ARCs (advance review copies). Whichever I get first, I’ll share here! Right, I have a problem: From photo #2 – I can’t see the words. P.S. : Who’s the principal “character”? Yes, unfortunately to make the image small enough to fit, the words are pretty hard to read. But you get the idea! The main character in The Way We Fall is Kaelyn Weber. Hmm… Make a text PDF or DOCX and post here 😀 What do you think?